Lois Maxwell, the Miss Moneypenny of the Bond spy sagas, has ben pensioned off. Now she reveals some of the off-screen secrets of the three 007s... In 14 films, she spoke fewer than 200 words and her total time on screen was considerably less than an hour. It was the smallest part the actress ever had, in a film career that, with the best will in the would, could not be described as meteoric. Yet that brush with stardom was enough to turn classy Canadian Lois Maxwell into an international legend. 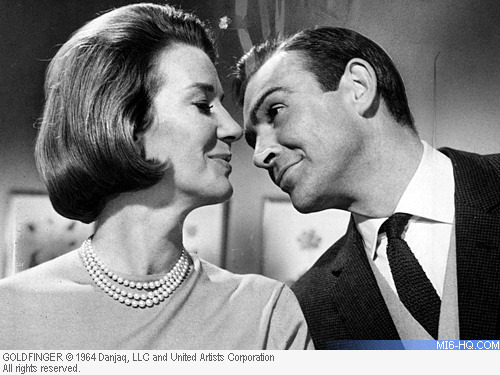 The public, even in her hometown, has long since forgotten most of her other work: Lois will always by Miss Moneypenny, James Bond's flirty secretary - the original Bond girl. 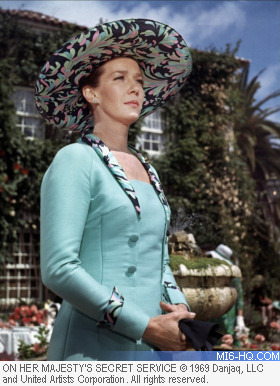 Today Lois Maxwell is 59, and after a quarter of a century of Bond films (spent principally ticking off 007 for being late) she has finally been pensioned off. Bond producer Albert R. Broccoli himself did the deed last month in a phone call. It was not an easy moment for Cubby, but the old Moneypenny was clearly going to look preposterous fluttering her eyelids at Timothy Dalton, chosen recently as the new James Bond. Everything, the flustered producer explained, was going to change. He was so, so sorry. But the end of Miss Moneypenny means that for the firest time Lois, until now the soul of discretion, has been able to open the filing cabinet drawer marked Gossip and share its contents with James Bond fans. She can, for example, shed light on the Great Garlic Incident of 1969. It was one of that year's show business stories. The Bond team was in Portugal, making the first post-Sean Connery film, 'On Her Majesty's Secret Service'. Diana Rigg, the female lead, was sensationally reported to have eaten garlic deliberately before a love scene to upset the unpopular new Bond, George Lazenby. Yet only Lois can tell what really happened. FACT: Rigg didn't eat the garlic deliberately. "I had lunch with Diana that day", said Lois. "It was squid in loads of wine and garlic. Diana suddenly said: 'Oh my God, I'm doing a love scene with George this afternoon.' I knew an old remedy of chewing tea leaves. I got some and she chewed on them, but it didn't work." FACT: The film company tried to foster the image of Lazenby and his leading lady being at loggerheads. But at a dinner after the film was made, Lazenby told Maxwell: "We were actually having a spat (an affair) at the time." Lois says this is most unlikely. Lazenby, gorged on pretty women because of Bond, was boasting about all sorts of unlikely conquests. The cool eye of Moneypenny was observing and taking note long before that. There was, for instance, the never previously reported 1964 Connery Caviar Scandal. "I had first met Sean in Cubby's office back at the beginning. He had that wonderful atmosphere of menace and moved, as Cubby said, like a panther. But he was still a poor young actor in rumpled corduroys who looked like he lived in a bedsit. By 1964, however, when we had the party at the Dorchester for the third film, 'Goldfinger', he was very much his own man." "He had been taught everything from how to dress and where to buy his shirts to table manners. His Scottish accent was ironed out. In 'Dr. No', they had to film his dialogue one line at a time, but not now. At the party I went over to get some caviar. Sean was eating the caviar with a big serving spoon. I said: 'Sean, you mustn't eat from that'. He just turned round and said quite pleasantly: 'I can have caviar whenever I want now.'" He just turned round and said quite pleasantly: 'I can have caviar whenever I want now.'" "I think he was serious. I don't think he was drunk. I've never seen Sean drunk."